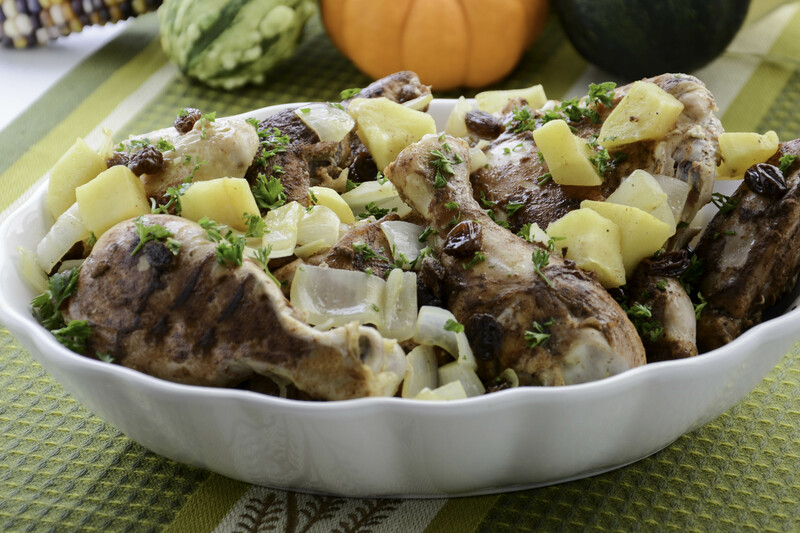 Made in a Dutch oven, this autumn-inspired dish will fill your kitchen with a delicious aroma. Combine cinnamon, cloves, salt, and pepper in a small bowl. Remove and discard chicken skin. Use your fingers to rub chicken with cinnamon mixture. Heat oil in a 4-quart saucepan or Dutch oven over medium-high heat. Add half of chicken; cook, turning occasionally, for about 5 minutes or until lightly browned on all sides. Use tongs to transfer chicken to a plate or bowl. Add remaining chicken, onion, and apple to pan; cook, turning occasionally, for about 5 minutes or until chicken is lightly browned on all sides. Return first batch of cooked chicken to pan. Stir in orange juice and raisins. When liquid comes to a boil; reduce heat to medium-low; cover and simmer for about 25 to 30 minutes or until chicken is thoroughly cooked. While the chicken is simmering, prepare basmati rice according to package instructions. Serve with prepared rice and warm pita bread. Curly-leaf parsley may be substituted if flat-leaf parsley is not available.